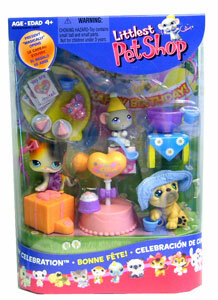 Description Of Item: It's a birthday bash extravaganza with 3 pets and 20 accessories for lots of fun and celebration! There's even a giant gift that each pet can open with its paw! Serve punch, cake and be sure to play plenty of games! This is one party that never has to end! Playset includes dog, cat and mouse figures, 3 invitations, punch bowl, ladle, 3 cups, 2 pieces of cake, cake, mouse toy, ball of yarn, table with balloon, hair bow, skirt, sun hat, birthday hat, and 2 presents.